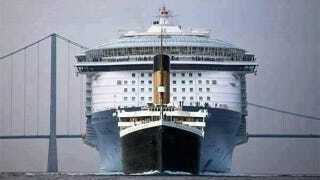 James Sexton posted this comparison image of the Titanic and a modern cruise ship. After watching so many movies and seeing so many photographs, I'm disappointed. And kind of amazed, too. Of course, the Titanic was a beautiful ship and, if you had the money, it was an amazing ride (until you died). Modern cruise ships are giant floating cattle trucks full of "entertaining activities" and all-you-can-eat-and-poop crap food.